Mohammad Amir is a Pakistani international cricket player who was born on 13 April 1992 in Punjab, Pakistan. He is a left-arm fast bowler who bowls regularly at 140-145 kph. His skiddy bouncers and deadly swinging deliveries often torment the batsmen. He has also proved himself as a handy batsman with his left-handed batting in the extreme lower order. Amir joined Bajwa sports academy set up by former Pakistani player Asif Bajwa in 2003 when he was just 11 years old. He was first recognised and selected by former legendary fast bowler Wasim Akram during a fast bowling camp in 2007. Later, he got an opportunity to represent Pakistan U-19 cricket team on a tour to England. Amir grabbed it with both hands, claiming 8 wickets at an average of 16.37. In 2008, Pakistan U-19 team played a tri-nation tournament in Sri Lanka and Amir glistened once again with his swing and bounce, taking 9 wickets at 11.22 in three games. In March 2008, he played his first domestic game for the Rawalpindi Rams and at the same time, he was playing for National Bank of Pakistan as well. In his debut domestic season, he emerged as a flamboyant performer by taking 55 wickets for NBP. Amir made his debut in 2009 ICC World Twenty20 against England on 7 June, when he was just 17 years old. He took his first international wicket on his very second ball and conceded only 1 run in his first over. However, he gave 30 runs in his next two, finishing with an economy of 10.33. Amir impressed with his performance in every game of the tournament, taking a wicket in his opening spell in 6 of 7 games. Amir had risen to prominence in his early career. After his successful World Twenty20 tournament, he made his ODI debut against Sri Lanka on 30 July 2009, taking 3 wickets and also scoring 23 runs. In an ODI game against New Zealand, he scored 73*, batting at number 10 which was a world record that time. In his first Test against Sri Lanka, he took 6 wickets and later against Australia, he led his team to the victory, which was Pakistan’s sole Test victory against the men from Down Under in 15 years. He took 7 wickets in the match and awarded Man of the match. In 2010, Pakistan travelled to England for a Test series. 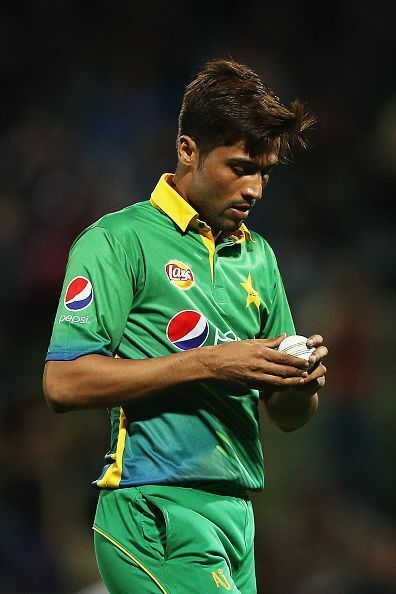 Though Pakistan lost the series 3-1, Amir emerged as a star performer, taking 19 wickets and scoring 67 runs. He played his first major tournament as 2017 ICC Champions Trophy after returning from ban. Playing in the final, he took wicket of Rohit Sharma, Shikhar Dhawan and Virat Kohli in quick succession. It was his dream spell which won the trophy for his team. Amir was an exceptional player but was naive and still juvenile. Being from a poor background, he couldn't keep himself away from greed of money. In a Test match against England, he deliberately delivered two no balls owing to a deal with the fixers. On 29 August 2010, he was arrested for spot-fixing and was sentenced to a five-year ban. On 29 January 2015, ICC gave him permission to play domestic cricket before the official expiration of the ban. As a result, Chittagong Vikings signed him for 2015 Bangladesh Premier League. He was also acquired by Karachi Kings in Pakistan Super League and took a hat-trick in 2016. Amir also represented Essex in the 2017 English county season. Amir has played 28 Tests and 36 ODIs in his career till date. In Tests, he has 95 wickets at an average of 31.47 and in ODIs, he got 55 wickets in his name at the average of 27.41. He has also played 31 T20Is for Pakistan and claimed 38 scalps. ICC World Cup 2019: Who are the biggest game-changers for Pakistan?